The Palestinian Prisoners’ Society (PPS) has reported that a Palestinian detainee died in an Israeli detention facility, Friday. 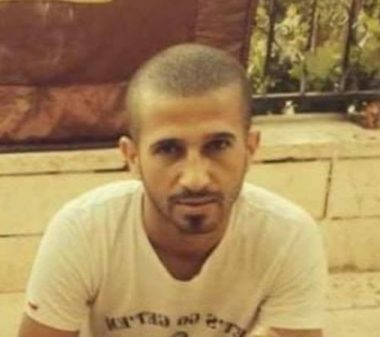 The PPS said the detainee Wisam Abdul-Majid Shalalda, 28, from Sa’ir town, northeast of the southern West Bank city of Hebron, has died in Ayalon Israeli prison, in Ramla. The PPS added that the circumstances of his death remain unknown, while members of Shalalda’s family said they were only informed that he had a stroke, and were asked to head to Abu Kabeer Israeli Forensic Institute. The PPS said the detainee, a married father of four children, was taken prisoner in 2015, and was sentenced to seven years in prison. It is worth mentioning that Shalalda is the fourth detainee who died in Israeli prisons, or after being detained, since the beginning of this year. The first is Yassin Saradeeh, 33, who was killed on February 22, 2018, by Israeli soldiers who shot him, then beat him repeatedly while he was lying on the ground. The second is Aziz ‘Oweisat, 53, who died at an Israeli hospital, on May 20, 2018, from serious complications when he was assaulted by several soldiers in the prison, after they claimed he attacked an officer with a sharp object. The third is Mohammad Zaghloul al-Khatib, 24, who was killed, on September 18, 2018, by Israeli soldiers who invading his home at dawn, before abducting and repeatedly assaulting him.